What’s better than the Fourth of July—celebrating freedom, opportunity, and gratitude for all we have here in the USA, all wrapped up in red, white, and blue, and centered around time with family and friends? Celebrating just steps from the ocean! We suggest picking the place you want to watch fireworks and working backwards to plan the rest of your holiday from there. Ready? Get set! Let’s go celebrate! Don’t get caught by a high tide. Here’s the Fourth of July 2018 Tide Schedule. 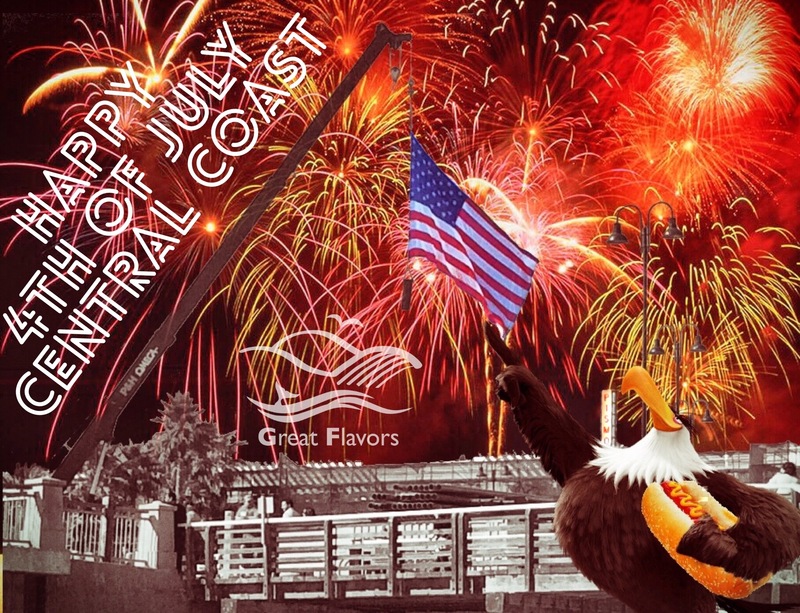 Pismo Beach and the surrounding beach towns are packed with Fourth of July activities.  Fireworks: The fireworks begin at 9:00 pm from the Pismo Pier. 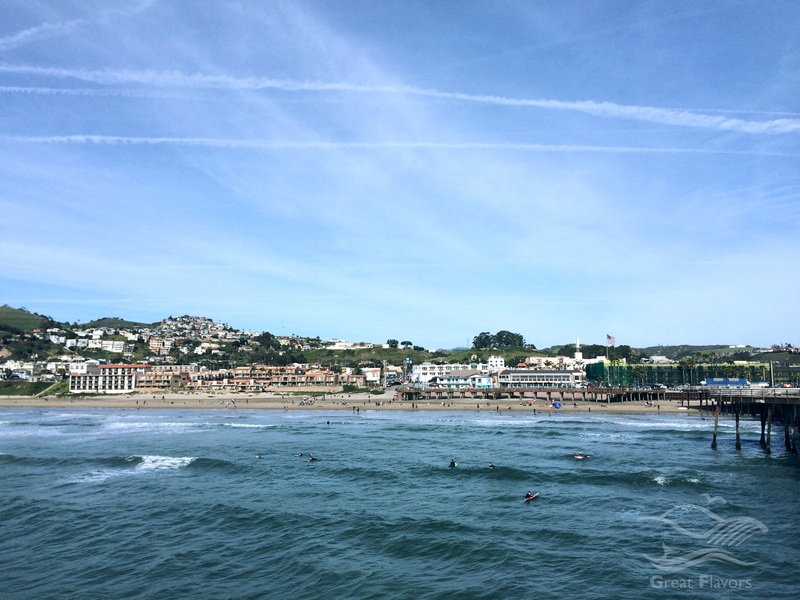 • Although the Pismo Pier is closed for repairs, Pismo Beach will be hopping. There will be arts, crafts, food, and music downtown. • The Avila Beach Doggie Parade starts at 11:00 on the Avila Promenade. Free to watch; if your pooch wants to participate, registration required. • At noon, the Avila Beach San Luis Yacht Club Boat Parade sets off from the Cal Poly Pier. • Check out the Village Band performance at 1:00 in the Rotary Bandstand in the Arroyo Grande Village, and munch on hotdogs, lemonade, and ice cream. • Spend the day on the beach! 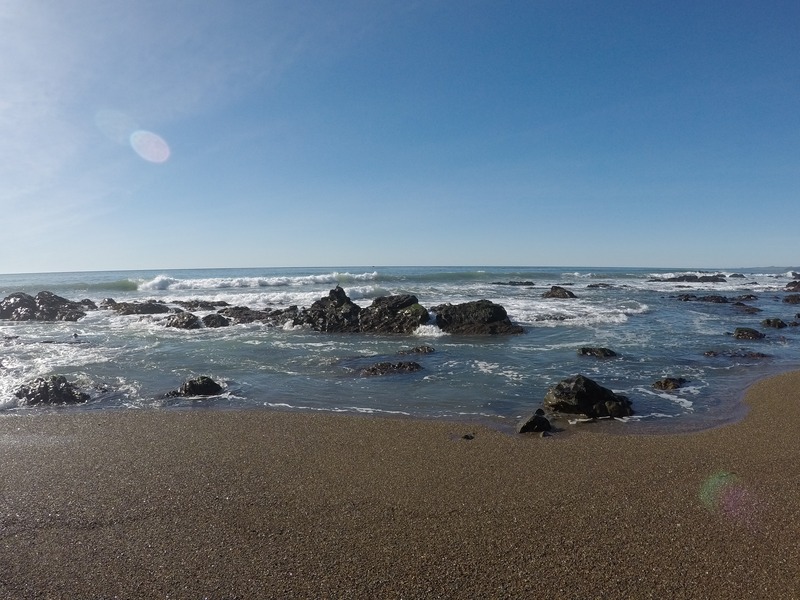 Heading south from Pismo Beach to the Grover Beach Entrance Station, buy a day pass and claim your spot to set out blankets, beach chairs, and dig a pit for a campfire. (Here’s how: Firelight Rhapsody: Enjoy the Simple Pleasures of a Pismo Beach Campfire (10 Easy Steps). Or take a long walk on the beach—from Pismo Beach all the way south past Oceano.  Breakfast: Start the day with stick-to-your ribs fare from Penny’s All American Café in Pismo, L’il Bits in Grover Beach, or the Village Café in Arroyo Grande. Or, head to the Avila Beach Pancake Breakfast fundraiser from 8:00 – 11:00 am at the Avila Beach Community Center, 191 San Miguel Street. Cost is $7/person and $3 for kids ages six and under.  Lunch: If you’re not up for cooking your own lunch on the campfire, grab clam chowder from Brad’s in Pismo or Mexican from Zorro’s in Shell Beach and have a picnic. If you want to eat in, check out Rooster Creek Tavern in Arroyo Grande or Rosa’s in Pismo Beach.  Dinner: Take out: In Grover Beach, Juanita’s Mexican (al pastor tacos) and Villa Del Mar (shrimp tacos). Eat in: Divine Thai and The Spoon Trade in Grover Beach; SeaVenture overlooking Pismo Beach, or Blue Moon Over Avila in Avila Beach. Or cook over the open flame of your campfire. (Here’s how: Firelight Rhapsody: Enjoy the Simple Pleasures of a Pismo Beach Campfire (10 Easy Steps). From Morro Bay up the beach to Cayucos, you can fill your day with Fourth of July fun.  Fireworks: The fireworks begin at 9:00 pm from the Cayucos Pier. 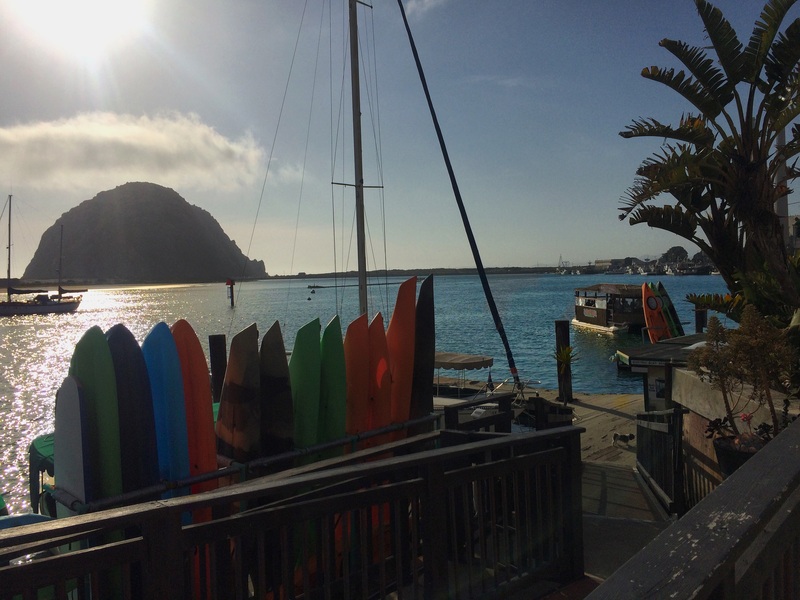 If you spend your day in Morro Bay, check out several cruises that will take you to Cayucos to be closer to the fireworks. Or set up your beach chairs along Morro Strand and watch the fireworks from there.  Breakfast: Blue Sky Bistro in Morro Bay; Lunada Garden Bistro in Cayucos.  Cayucos Activities: Sand Sculpture Contest: 5:00 – 8:00 am by the pier. Annual Parade 10:00 am, Ocean Ave. Lion’s Club BBQ/food 11:00 – 3:00, Vet’s Hall. Bingo 1:00 – 4:00 pm, Vet’s Hall.  Morro Bay Activities: Most activities take place at Tidelands Park, on the south end of Embarcadero. Skateboard Race, 10:00; Bike Parade, noon; 4th of July Opening ceremony, 1:00; Paddle Parade, 2:00; Family Carnival, 12:00 – 5:00, at Tidelands Park with dunk tank, bounce house, games, food vendors, and live entertainment.  Lunch: Ruddell’s Smokehouse in Cayucos. Kuma Bowls in Los Osos.  Dinner: Ruddell’s Smokehouse (yes, dinner, too: it’s that good) and Cass House in Cayucos. Brick House BBQ and House of JuJu in Morro Bay. Cambria’s Shamel Park (5455 Windsor Blvd.) is the place to celebrate the 4th of July with food, fun, dancing, prizes, and more. The day kicks off at 11:00 with the opening ceremonies. Be sure to check out the Waiter/Waitress tray relay race from 2:00-3:00 and Linn’s Messy Pie Eating Contest at 3:00. The pool is open 11:00-6:00 and children’s games run all day. Free parking and admission. The trolley runs 11:00 am to 7:00 pm with stops along Main Street to Moonstone Beach Drive.  Fireworks: Fireworks begin at dusk from Shamel Park, 5455 Windsor Blvd.